When Duluth Animal Hospital Client Services Receptionist Alicia Williams brought a fluffy white chicken to work one day, other staff members couldn’t believe what they were seeing. The chicken in question — Penny, a beautiful and unusual silky chicken Williams rescued. Penny may have it made now, coming in for office visits in her polka dot “chikini” — William’s nickname for Penny’s chicken diaper — and meeting her adoring fans. 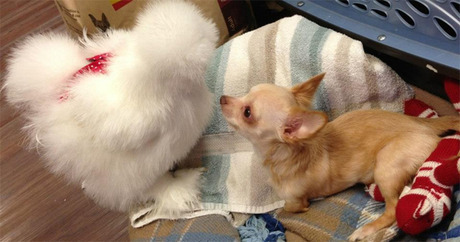 But not long ago, Georgia’s favorite fluffy white chicken was in a dire situation when Williams first met her. Penny underneath her fluff (In case you’re wondering). Williams couldn’t sit idly by while this little chicken was killed. Even though she knew next to nothing about chickens, Williams asked if she could adopt the silky chicken instead. The facility agreed and Penny went to her new home. “I’ve had parrots before in the past and they’re very different,” Williams explains, drawing a comparison. Williams learned quickly that Penny, a flock animal, was very lonely at home whenever Williams left for work. So, rather than leave poor Penny to her own devices, Williams started bringing Penny to work. There, behind the front desk, Penny socializes with her fans and, every so often, lays an egg. But Williams could sense that Penny might like a partner in crime, an animal friend. That’s where Roo came in. Last February, a client found a tiny 7-week-old Chihuahua shivering in a ditch. The puppy seemed healthy, except for one thing — Roo was born without his two front legs. Roo and Penny became instant buddies, Williams says. They chew on doggie toys together and even share the same carrier on their way to the vet’s office. “He loves snuggling with her because that’s his big teddy bear,” she adds of Roo and Penny. Recently, Roo was fitted with a special wheelchair Williams calls “the treat mobile,” paid for with money donated by one of the animal hospital’s generous clients. Roo’s shiny new set of wheels allows him to get around much easier, meaning he can follow the very active Penny around all day long. “He runs her over sometimes because he doesn’t realize how big his wheels are,” says Williams. Roo isn’t Penny’s only canine companion — Williams also has a rescued Pit Bull Terrier named Lucy at home who is gaga for her chicken pal. Penny and Roo are hardly the first examples of different animal types bonding; in November 2013 we reported on dog Rex and goose Geraldine.